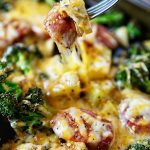 Add sausage, broccoli and potatoes to sheet pan. Toss with olive oil, steak seasoning, garlic powder and paprika. Roast for about 20 minutes, until potatoes and broccoli are tender. Remove from oven and top with cheese. Return to oven for a minute or two, just until cheese melts.